Hermann, Mo – Owensville had the lead 30-33 and the ball with less than 10 seconds to go, when New Haven was able to force a turnover, calling a timeout with point seven seconds left. New Haven would be inbounding the ball in front of their bench. The inbound pass went to Stephanie Scheer, but her game tying shot came up short. Owensville lead 17-28, their largest lead of the night, with two minutes left in the third. 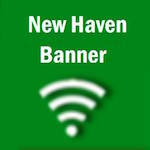 New Haven battled back to end the third quarter on a 7-0 run toped off by Lindsey Nixon draining a three as time expired ending the quarter down 24-28. The Dutchgirls came out in the fourth, quickly giving themselves a seven point lead, 24-31. The Lady Rocks continued to battle back, down 31-28 with 2:04 left, Owensville turned the ball over. On the ensuing play, Megan Shockley was fouled on the shot, but would miss both free throws. Pictured right: Mackenzy Vedder fouled on the shot. Owensville scored on the very next position taking a five-point lead with 1:20 to play. New Haven’s Mackenzy Vedder made a strong move to the basket and fouled on the shot, converting both free throws with 50 seconds on the clock. New Haven's last second shot came up short to end the game 30-33. Molly Munsinger had a team high seven points and Scheer added six points for the Lady Rocks. The JV team will next play on Sat. at 10:15 a.m. for third place against Hermann.